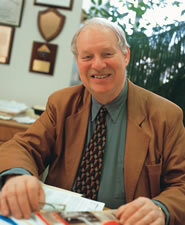 Born in Czechoslovakia, Novotny attended the University of Brno where he received a Ph.D. in biochemistry (1965). Following postdoctoral positions at the Czechoslovak Academy of Sciences, Royal Karolinska Institute (Sweden) and University of Houston, he joined the faculty at Indiana University in 1971. Professor Novotny has later received honorary doctorates from Uppsala University, Sweden (1991), Masaryk University, Czechoslovakia (1992) and Charles University, Czech Republic (2007). At IU, he is currently a Distinguished Professor Emeritus and Director of the Novotny Glycoscience Laboratory and the Institute for Pheromone Research. Professor Novotny has been a pivotal figure in the development of analytical separation methods for more than 40 years. His highly acclaimed efforts in microcolumn separation techniques of liquid chromatography, supercritical fluid chromatography, and capillary electrophoresis represent important innovations in modern analytical chemistry. He has also been known for his research in proteomics and glycoanalysis and for identifying the first mammalian pheromones.